Reason # 5689 – Why I love Halloween. . . . . . I get to see my kids in all their glory. And. . . .I’m guaranteed at least one really good laugh, every year. I’ve got this kid, Shelbi. She’s nine and she knows IT ALL. I’m as serious as a heart attack.. She really does know it all. Don’t tell her I told you, though. It’ll blow my cover. I’ve been telling her I’m the “Know it All”. But, she doesn’t believe me. The other day, the school nurse called her teacher and said Shelbi’s eyesight is really bad. The nurse told her teacher to move Shelbi immediately to a seat directly in front of the board. Shelbi was completely mortified by the move. She hurried home from school and informed me of the situation. I told her don’t worry, I’ll call the nurse tomorrow to see what’s going on. And. . . . .I forgot to call. Shelbi was slightly perturbed, but not at all surprised that I forgot to do what I said I would do. So the next morning, she asked if she could leave me a note to call the nurse, IN MARKER, on my bathroom mirror. “But you’ll forget,” she whined. She huffed, grabbed her backpack and walked out the front door on her way to school. I forgot to call again. Until. . . . . I strolled into the kitchen, and saw the plethora of notes tacked all over the kitchen, reminding me to call the nurse. What can I say? Hi, my name is Nicki Woo. I have a kid who’s a “know it all”, and I’m an absent minded liar. It’s okay. I’m good with that. So I called the school nurse, and found out she’d made a mistake. 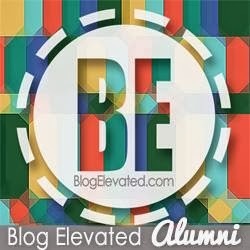 Shelbi was redeemed, and got to move back to her old seat. Everyday I live with my my kids, I’m so tickled because I get to find out more about their personalities. Like how Shelbi is super responsible, dependable, and genius-like. The type of person you call, when you’ve only got one call left. Just like her father. Aaaaahhhh. . . .gotta love that man. 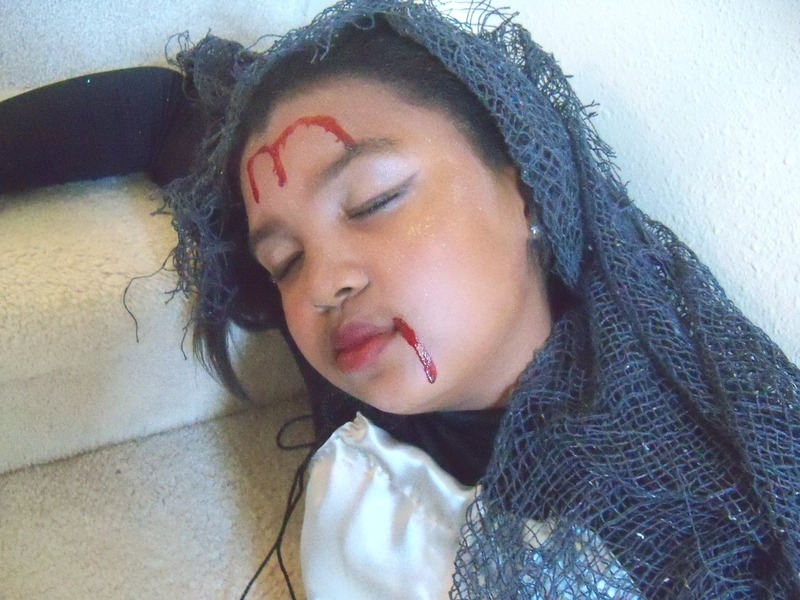 And Halloween, like all holidays, brings another opportunity for their very faceted personalities to shine through. 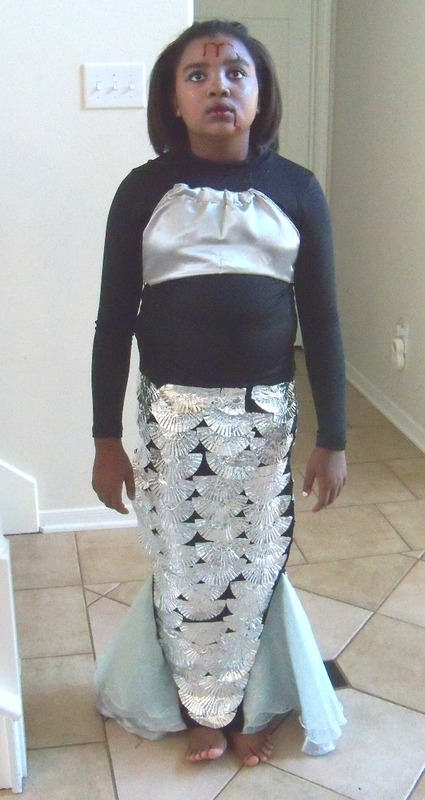 This year, Shelbi has informed me that she wants to be a Mermaid. Nice. I thought. A little surprising, though. She hasn’t gone for the “pretty” since she was 4. But okay, I can dig it. And I think, I’ve never been so proud of that kid in my entire life. That’s pure genius. I get it, if you don’t want to be a DEAD MERMAID. It’s not for everybody. 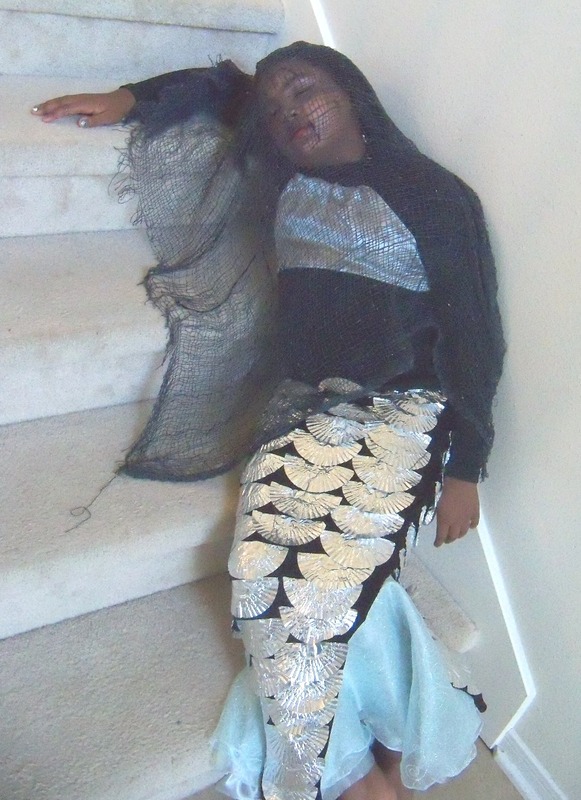 But on the chance that you want to be an ALIVE MERMAID, you can use this tutorial also. Just nix the killer net, dripping blood, and white no-blood circulating face with black out eyes. You can be pretty if you want. We won’t judge. 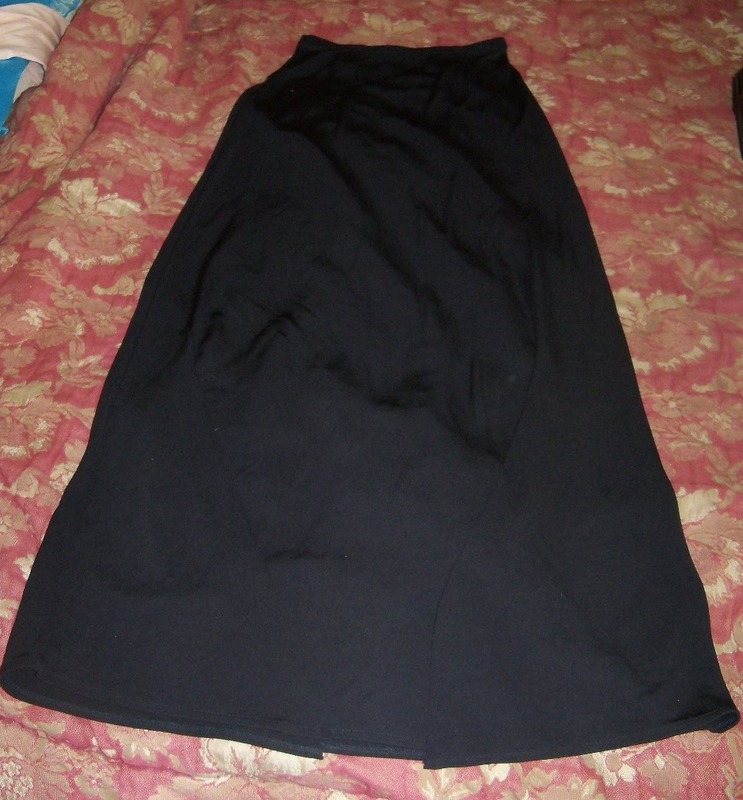 Long Skirt (made of stretchable material) – We purchased our’s from goodwill for $5.00. *All costume fabric is currently 60% off at JoAnn Fabrics. Mermaid’s Flippers at the end of the Tail. Using your child as a guide, decide how large you would like the tail to be. The dimensions on our flippers are as follows. 1. 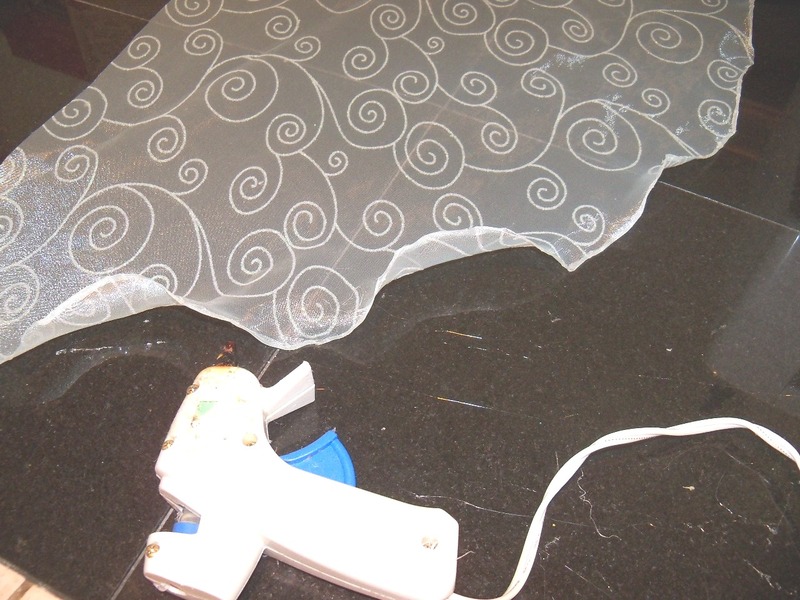 Using the diagram as a pattern, cut the silky costume fabric to those exact dimensions. Repeat. 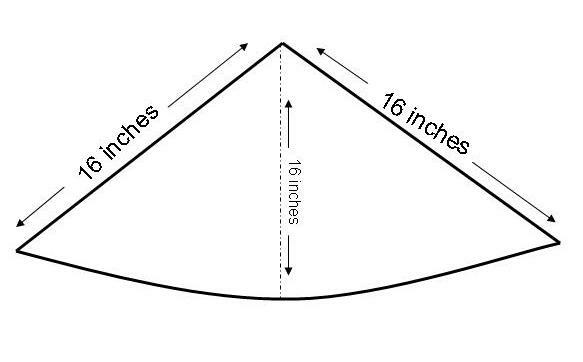 You should have two pieces of material shaped in wedges with the dimensions of 16 inches. 2. Next, following the same pattern, but changing the dimensions to 15”, cut the sheer costume fabric to resemble the first cutout. This should also be done twice. 3. Again, following the same pattern, but changing the dimensions to 14”, cut the sheer costume fabric to resemble the first and second cutouts. This should be done twice. 4. 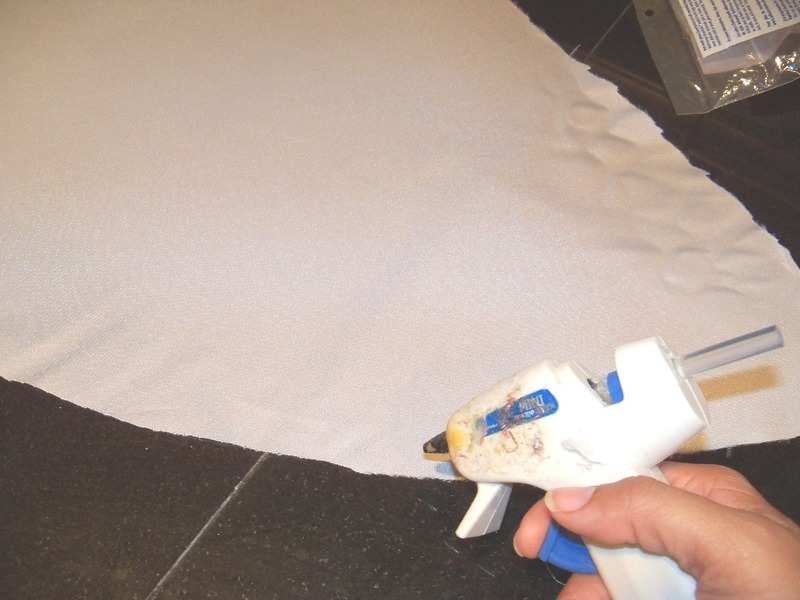 Using a glue gun, finish the edges of each piece of material by placing a thin line of glue (on the back side of the fabric) along the edge and gently tucking over. 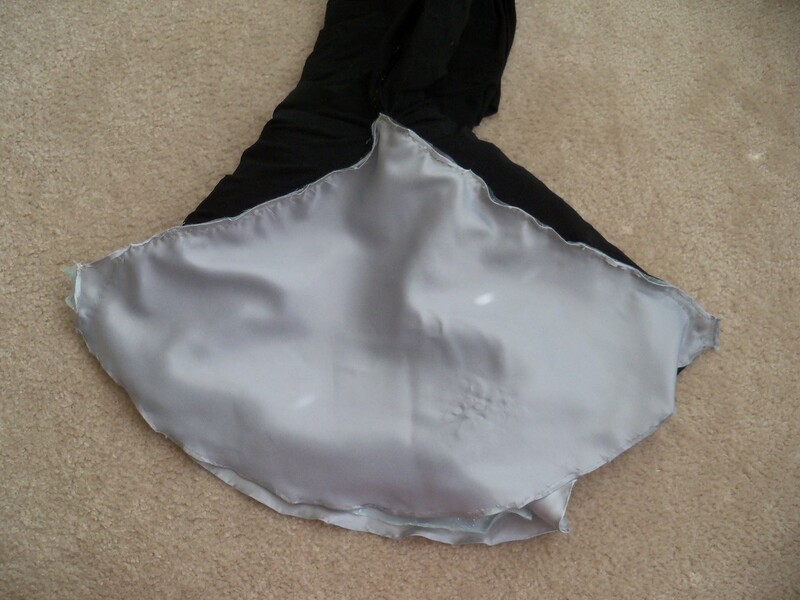 This will ripple the ends of the fabric, and give the tail more body, once it is sewn onto the skirt. 5. 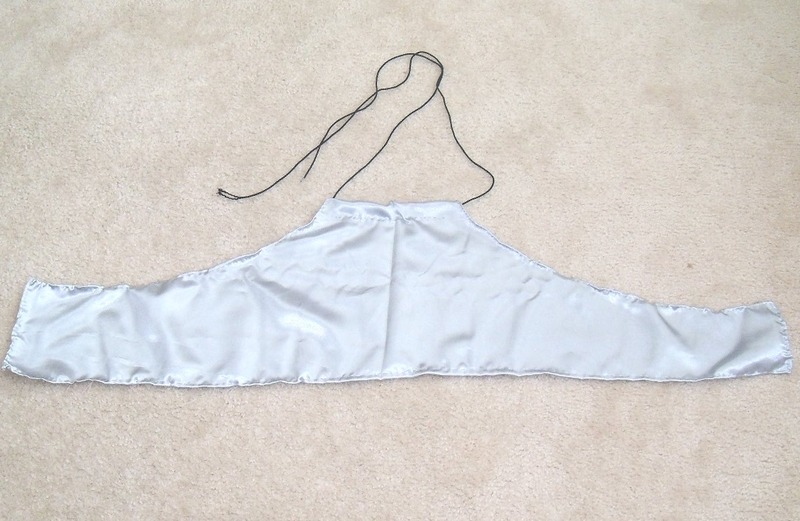 Take one fabric cutout of each size (14, 15, 16”) and place one on top of the other, right side up. The 16” cutout should be on the bottom, with the 15” in the middle, and the 14” on top. Sew the edges together to keep in place. 6. Lay your skirt on a flat even surface. Using your scissors make one large 16” slit on the right side of the skirt, and one on the left. 7. Sew the fabric cutouts (that have now been layered and sewn together) to the new opening slits in the skirt. Part II: The Scales on the Tail. 1. 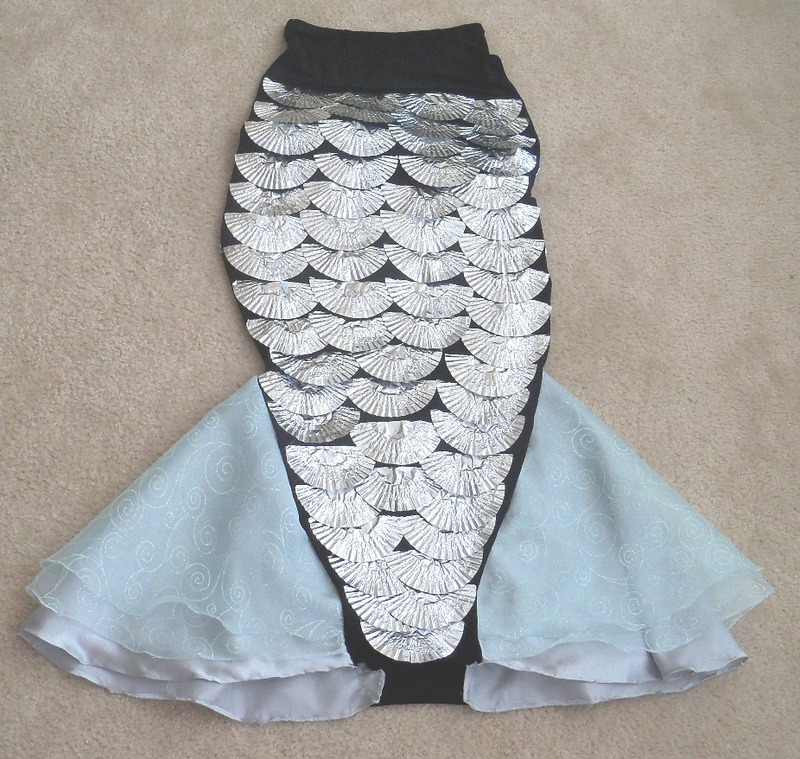 Place the skirt with flipper attached onto a flat table. 2. Remove the paper cupcake liners from the aluminum liners (you will not be using the white paper liners). Cut each aluminum liner in half. 3. Starting at the bottom of the skirt, hot glue each liner directly onto the skirt. 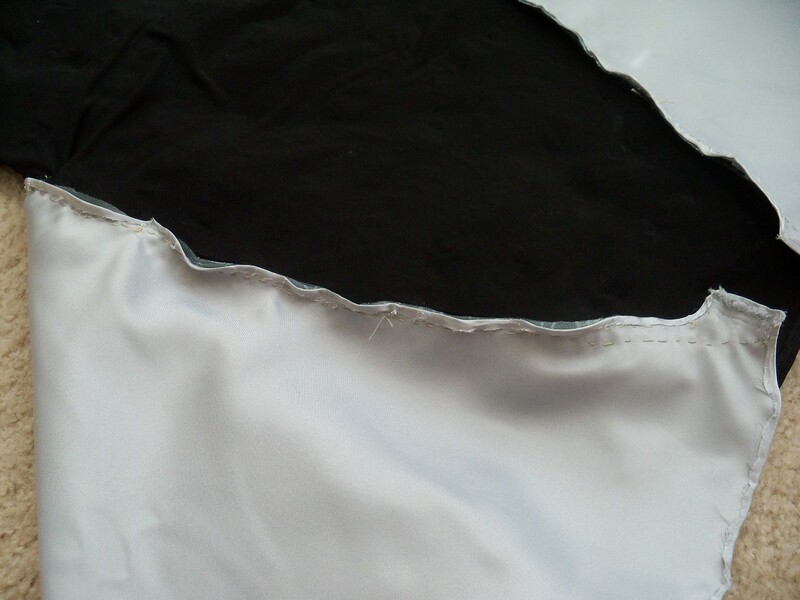 Only place glue along the top edge of the liner, so that the scales can gently lift off the skirt. This gives a more realistic look. 4. 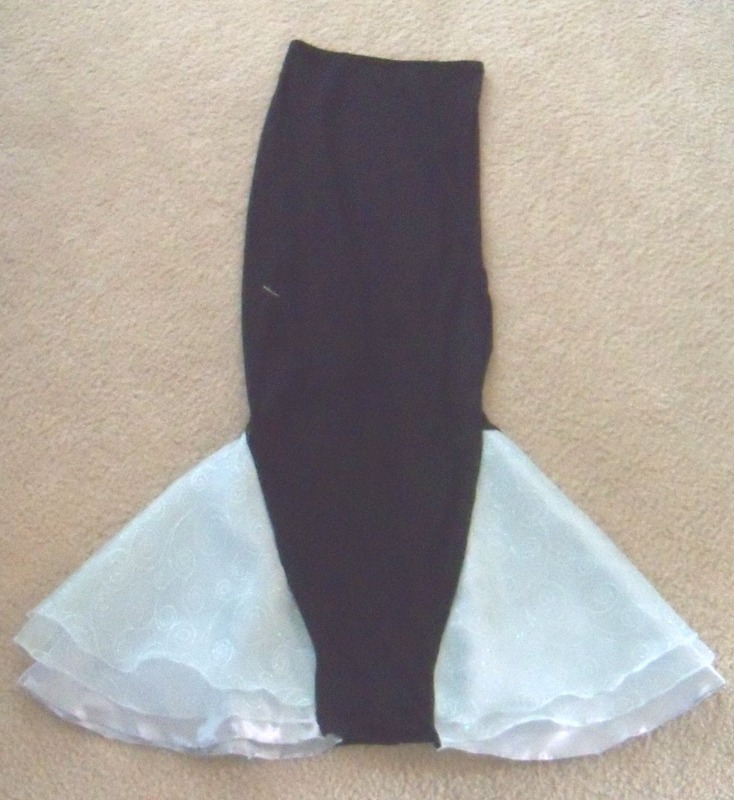 Continue to layer the liners until you reach the waist of the skirt. Turn the skirt over, and repeat on the back side. 1. 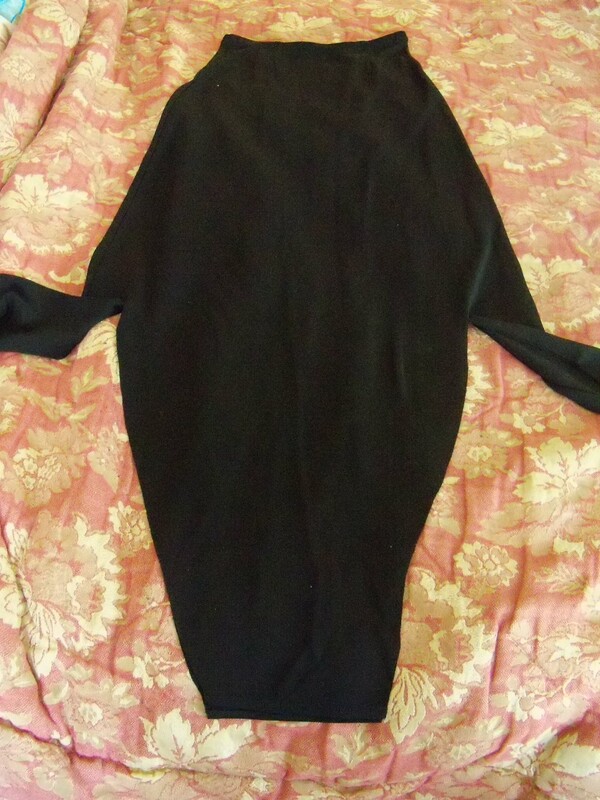 Using the same silky costume material you used in the tail, find a piece of material that will fit all a way around your child’s torso, with at least an extra 8 inches on each side (enough extra material to be able to crudely tie the top together in the back). 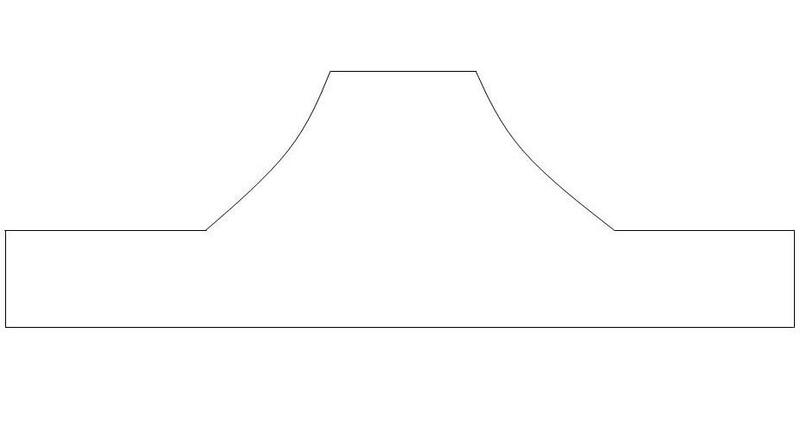 Cut the fabric in the shape of the diagram below. The exact dimensions will be determined by the size of your child. 2. Very crudely quick sew the edges of the fabric the make the ends look finished. 3. With the material laying flat on the table, wrong side up, pull the shorter top end over about one inch. Sew into place. Pull a long ribbon through the opening. 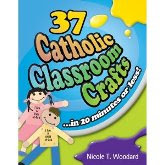 This will tie around your child’s neck. 4. 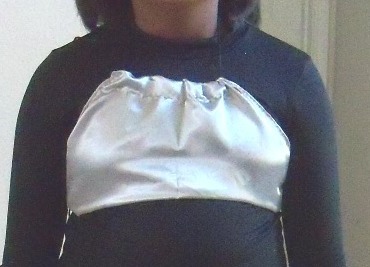 Wrap the bottom half of the material around your child’s torso, and tie in the back. 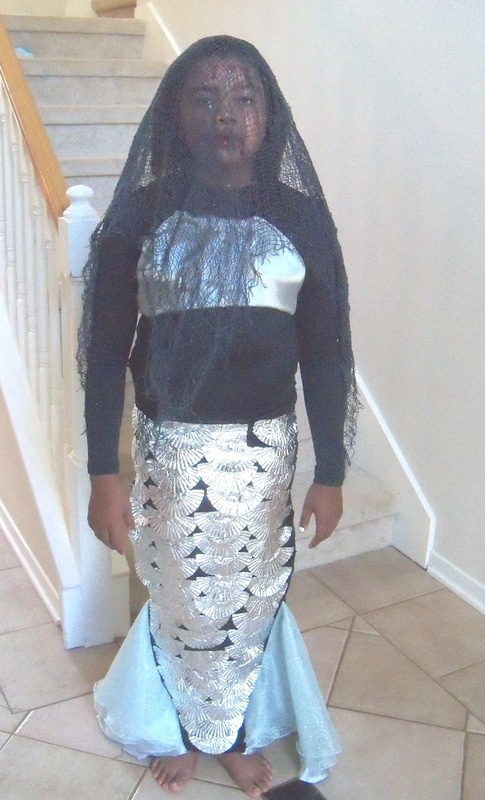 A little bit extra. . . .
Our mermaid, met a sad demise, so she is also draped in netting costume fabric. 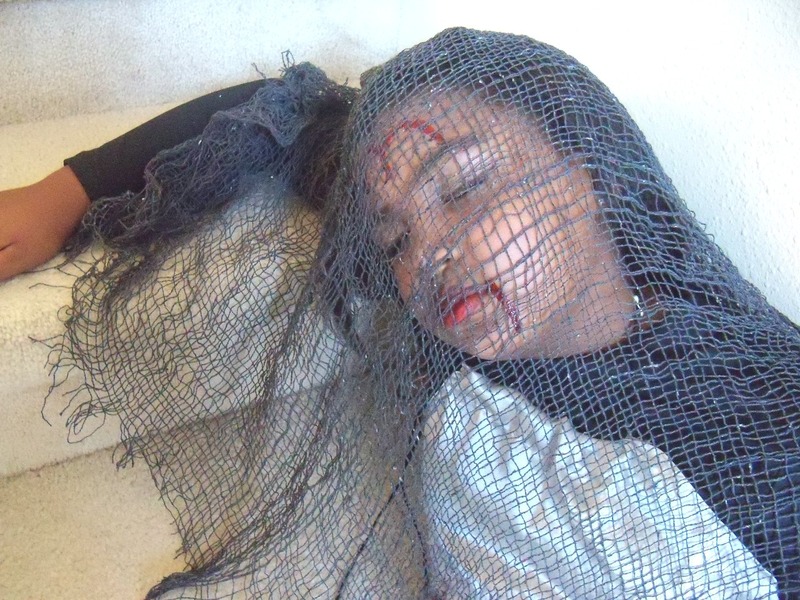 She’s lost some of the color in her skin thanks to light foundation, and her untimely death. Though she does still have a dewey Mermaid glow from her magical powers and glitter. There looks to have been some sort of struggle, that blackened her eyes that are also hightlighted with a pearly gray eyeshadow. Her sweet lips are still red from the blood that ran through her veins but now seeps through a crack in her skull, and drips from the side of her mouth. Tragic. Yet still beautiful. Now, that’s Halloween. * Shelbi has informed me that she is going to tie on seashells, and/or fake fish hooks to add to the beauty of her fish net.